Can I Play Jersey Cash 5 XTRA Online? Read Reviews! If you’re a lottery enthusiast, you probably know that New Jersey is the home of one of the luckiest people in the US. In 2016, Pearlie Marie Smith from Trenton won 429 million dollars from the Powerball May 7 drawing. It was a welcomed gift for the mom of seven. This article, however, isn’t focused on Jersey’s lucky people. It puts emphasis on a fun local lottery – Jersey Cash 5 Xtra. Jersey Cash 5 Xtra is one of the games in the portfolio of New Jersey Lottery – a state of New Jersey entity that’s responsible for operating games, paying out prizes and dedicating some of the proceeds to good causes. This particular game was set up in September 1992. Originally, it had a 5 out of 38 format. This original version also didn’t have a jackpot that rolled over in the case of no winner. Instead, if there was no jackpot winner for the respective drawing, the accumulated sum was added to the second prize tier. On September 2003, the game changed its format for the first time and it became a 5/40 lottery. On September 2014, New Jersey Lottery announced the current format by adding 3 more numbers to the pool. A guaranteed minimum jackpot of 75,000 dollars was also added to the rules. Is Jersey Cash 5 XTRA a Scam? With so many fraud schemes out there, it’s nothing but natural to be concerned about the legitimacy of a lottery. Let us offer you some assistance. After we’ve done the investigation for you, we’ve concluded that Jersey Cash 5 is completely legitimate. As already mentioned, this lottery is organized by a state entity. The New Jersey Lottery was set up in 1969. Ever since, it’s been adding games to its portfolio. Apart from Jersey Cash 5 Xtra, the organization also runs Pick 3, Pick 4, Pick 6 Xtra and 5 Card Cash. The New Jersey Lottery is also responsible for multi-jurisdictional games like Mega Millions, Powerball and Cash4Life. All of the New Jersey Lottery drawings are broadcast on live TV. In addition, New Jersey Lottery is also the first in the US to live stream the drawings on its official website and its Ustream channel. It doesn’t really get any more legitimate than that. Playing Jersey Cash 5 Xtra is a relatively simple endeavor. You’ll only have to pick your 5 lucky numbers from a pool of 43. A single ticket costs 1 dollar and drawings are held every day of the week. Apart from the basic option, the lottery offers a few additional cool opportunities. The Xtra portion of the name comes in the form of an additional perk that can be activated for a payment of 1 dollar on top of the ticket price. The Xtra can potentially increase the amount that players win. The aim of the Xtra is to give you a multiplier. If you match 3 or more numbers for the respective drawing, the sum that you’ll be entitled to is going to be increased by the multiplier number. A multiplier can be in the range from x2 to x5. An Instant Match feature can also be activated for a payment of 1 dollar. Since the pool of numbers you have to choose among is smaller than in the case of other state/national lotteries, the odds of winning the jackpot are relatively favorable. You have a 1 in 962,598 chance to get all 5 numbers correct. A multiplier will not apply to the jackpot. The biggest jackpot in the history of Jersey Cash 5 Xtra fell in April 2013. After multiple drawings without a winner, the sum had eventually reached 1.96 million dollars. The second biggest jackpot in the history of the game fell in March 2017. A total of 1.55 million dollars had accumulated after seven drawings without a jackpot winner. The sum was split between 2 lucky ticket owners. Each winner brought 774,385 dollars home. Other than the jackpot, there are 3 additional prize tiers. The second prize is handed to people who match 4 numbers. The odds of this happening are 1 in 5,066 and the prize is 500 dollars. Whenever a x5 Xtra multiplier is activated, the sum will increase to 2,500 dollars. Three correct numbers will produce a prize of 15 dollars and 2 correct numbers will produce a prize whenever an Xtra multiplier is activated. The overall odds of winning a prize in Jersey Cash 5 Xtra are 1 in 133. Prizes of up to 599.5 dollars can be claimed at any licensed retail venue. People who win a bigger sum will have to fill out a New Jersey Lottery Claim Form that can be downloaded from the official website. The completed form can either be mailed or submitted personally to the New Jersey Lottery headquarters. The same rules apply to out of state winners. They’ll once again be asked to mail a completed form and the winning ticket to the lottery headquarters in Trenton. Sums that exceed 5,000 dollars will be subjected to federal taxes. The sum withheld will be 25 percent for US citizens and 30 percent for foreigners living in the country. A state tax will also apply. The state tax is five percent for sums in the 10,000 to 500,000-dollar range. For larger prizes, the income tax will go up to eight percent. Can You Buy Jersey Cash 5 XTRA Tickets Online? 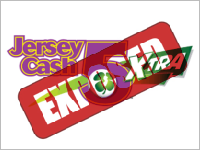 Jersey Cash 5 Xtra tickets are available at lottery retail venues throughout the state. If you don’t live in New Jersey or if you’re not a US citizen, you can buy Jersey Cash 5 ticket through TheLotter.com. Would you mind rating Jersey Cash 5 XTRA? Obviously, the shortcomings don’t really offset the benefits of the game. So, if you have 1 dollar to spare, you may want to give the lottery a try. While it’s probably not going to get you sorted for life, it can still result in cool payouts. How Much Does It Cost to Play Jersey Cash 5 XTRA Online? My absolute favorite thing about this lotto is that the odds of winning are high so I am guaranteed a winning almost every time I play. I always advise people not to look at the size of jackpot, but the odds of winning.